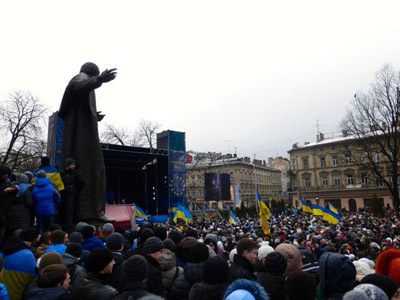 The people of Ukraine are demanding democracy, and ELAW co-founder John Bonine is there to witness. John arrived in Lviv earlier this week and is now in Kyiv with ELAW partners at Environment-People-Law (EPL). John's observations ran in today's Register-Guard and the Kyiv Post: Ordinary People Bringing Change to Ukraine. John helped launch EPL more than ten years ago, and ELAW more than 20 years ago. Our hearts are with the people of Ukraine. P.S. Learn more about ELAW's our work on our blog, Facebook, and Twitter.